The Find It Guide is a phone directory for Germany-based Americans. All contents of the printed version can be found on our product website, making The Find It Guide one of the most used portals by Americans in Germany. If you book a display ad in our printed edition, you automatically receive a enterprise membership on www.FindItGuide.com with a detailed company profile. With this online profile you can introduce your company online to all of your website users. Win even more attention for your company by using this type of banner. Striking and dynamic – stand out from the competition! 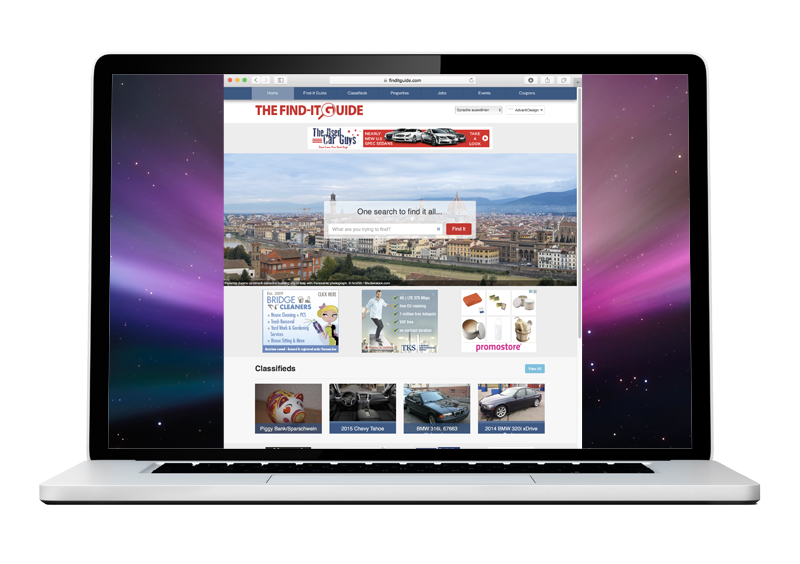 The Find-It Guide is fortunate to have a large online community. Use our outreach to make your company better known. Present your company on our online portal. Publish pictures, posts, videos and much more. Use all of our advantages for your success. Reach even more readers by strategically placing an ad in our weekly newspapers.